Sara Williams's hand in marriage was bought to cover a debt. But she's determined never to marry anyone! 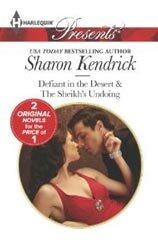 Diplomat Suleiman Abd al-Aziz must deliver Sara to her desert destiny. But with Sara set on escaping her marriage by seducing him, his iron will is sorely tested! Independent Prince Tariq Kadar al Hakam counts on no one. So when a car accident leaves this dynamic sheikh reliant on his sensible PA, Isobel Mulholland, he's furious! But with Isobel at his beck and call, could her enchanting touch, in fact, be Tariq's undoing...?